Mike Terrana is an American drummer, principally in the hard rock genre. His first professional work was in 1984 with the MCA band Hanover Fist, after which he recorded and toured with various bands, playing various styles of music in Western New York state. Between 1987 and 1997, he was based in Los Angeles, working with bands like Yngwie Malmsteen, Tony Macalpine, Steve Lukather (Toto), Jennifer Batten (Michael Jackson, Jeff Beck), Kuni and Beau Nasty. In 1997 Terrana moved to Europe, first in Holland for six months and then Germany. 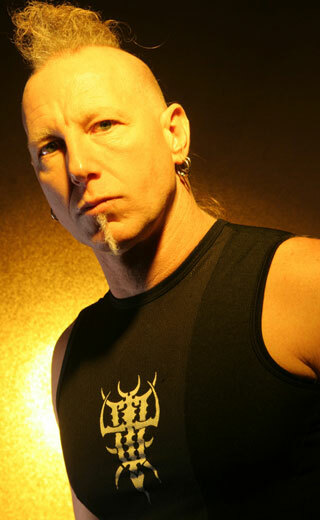 He worked with Gamma Ray, Rage, Axel Rudi Pell, Roland Grapow (ex-guitar player Helloween), Savage Circus. He is a recording and touring member of Masterplan; he also tours with Tarja Turunen. He is engaged in projects in the instrumental fusion genre and performs drum clinics around the world for the companies he endorses. "I believe all musicians share a common goal and that is the art of self-expression. This is easier said than done. 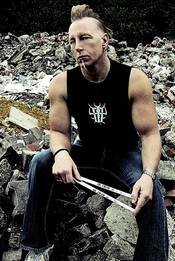 My style was forged form years of playing, practicing and emulating other great drummers. I found watching other drummer’s play is one of the best ways to learn. I think in order to really develop ones own personal style, one must cleverly combine the elements of Feel, Creatively, Animation, Control, Power and Finesse. We as drummers from time to time, should take a step back and watch and listen to the great drummers that came before us. Buddy Rich, Louie Belson the Father of Double Bass Drumming, Cozy Powell, John Bonham, Tony Williams and Terry Bozzio….just to name a few. When I sit behind my drum kit during a session or a live performance, my ultimate goal is to express myself and to support the band. I try to provide a good solid groove that makes everyone in the band feel good & comfortable, hopefully the final result is that this passion and energy in passed along to the listener. During the past years I have been really working hard to keep my drumming REAL in both live and in the studio situations, so that the drums sound more natural and alive. I like all the rough edges the human feel brings to the music. That’s what makes music exciting and free. The drums are a primal instrument and I like to keep it that way. I find quantizing and triggering drum samples are all things that KILL OFF the personality of my drumming. When I listen to a record I made, I like to hear my drum tuning, and my groove without all the bells and whistles that pro tools has to offer. I truly feel that the modern day computer technology has erased the personality & emotion of the modern drummer. Drumming for me has always been a physical and visually powerful display of the pulse within music. The Beat and the power of it, is what moves people. The beat provided by the drummer is the primal force that keeps the music moving forward. There is nothing quit so cool as watching and hearing a human being generate naturally sounding powerful rhythms. It’s captivating, hypnotic and its touches something deep inside the very soul of mankind. I love to play my drums and I love to play for people! It always gives me an overwhelming feeling of excitement and joy and I like to share that with the audience. For me creating and playing music is paramount. Its my life’s work and passion. I am certain, that without music or drumming in my life, I would not be a very happy man! So practice hard, be yourself and good luck!"